Dr. Francisco Artigas, director of MERI (left), says that monitoring sea-level changes in the region is important because "we’re worried we’ll lose those marshes with rising sea levels." 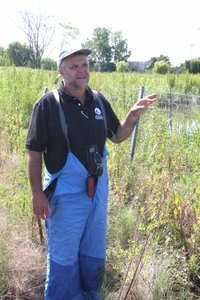 The region’s wetlands are indispensable for all sorts of reasons, including as crucial habitat for a wide variety of wildlife, but also, as Project Manager Ed Konsevick (below), a senior environmental scienti st for MERI, explains: "They are an important safeguard for tidal surges and storm surges." 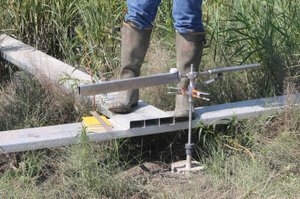 Sea levels have been measured for years, but never so scientifically. 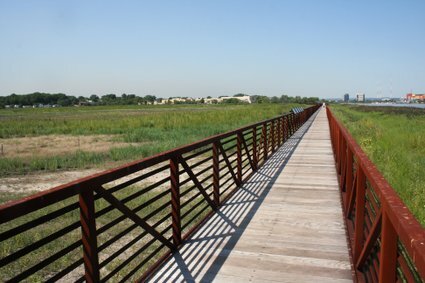 MERI is conducting the bi-annual surveys at 21 monitoring sites placed in seven marsh locations in Carlstadt, Lyndhurst and Secaucus, including the Secaucus High School Marsh (above), then sharing the data with the U.S. Geological Survey. 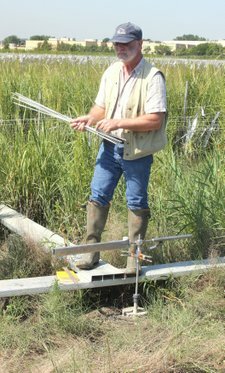 The USGS is measuring sea levels at several locations along the East Coast, and Dr. Artigas says it’s key for MERI and the Meadowlands Commission to participate in that effort: "It’s important because we are part of the bigger picture and we can be in touch with experts at the regional and national levels."